Iowa has a successful outreach project—Women, Land and Legacy: Building Your Farms’ Future Today (WLL)SM. This project was started in 2004 and is expanding and gaining interest from many parts of Iowa. WLLSM involves government, non-profit organizations, and faith based organizations and works to reach agricultural women in rural areas. Annie's Project has been an educational program dedicated to strengthening women's roles in the modern farm enterprise for ten years. To date, classes have been taught in ﻿34 states﻿. Through six educational sessions, Annie's Project fosters problem solving, record keeping, and decision-making skills in farm women. Practical Farmers of Iowa is an inclusive organization representing a diversity of farmers. Farmers in our network raise corn and soybeans, hay, livestock large and small, horticultural crops from fruits and vegetables to cut flowers and herbs, and more. Our members have conventional and organic systems; employ diverse management practices; run operations of all sizes; and come from a range of backgrounds. These farmers come together, however, because they believe in nature as the model for agriculture and they are committed to moving their operations toward sustainability. Women in Agriculture has as its mission to be the leading resource and advocate for women engaged in all aspects of agriculture. Our goal is to provide the educational opportunities women need to increase their skills in making business and financing decisions. We also seek to provide women opportunities to build networks and friendships with other women actively involved in today’s agricultural industry. Our Mission: To link and empower women to build food systems and communities that are healthy, just, sustainable, and that promote environmental integrity. 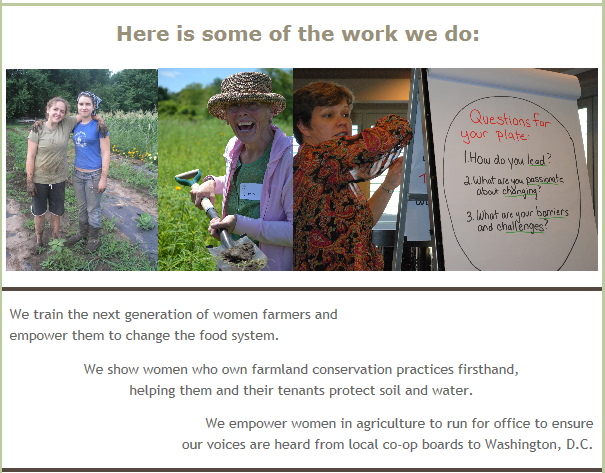 The Center for Rural Affairs is partnering with Women, Food, and Agriculture Network (WFAN) to help aspiring and beginning women farmers turn their farming dreams into reality through training and mentorships with established women farmers. The Mission of Feed Iowa First is to combat food insecurity today and tomorrow by growing food and farmers. American Agri-Women is the nation’s largest coalition of farm, ranch and agribusiness women with more than fifty state, commodity and agribusiness affiliate organizations throughout the country. AAW members have been advocating for agriculture since 1974. In developing Ma Joad, we found--much to our dismay--it was very difficult to find contemporary photos of women in agriculture. Then we found FarmHer! Women have always been an important but mostly undocumented aspect of agriculture. In recent years, women are rising to the forefront of agriculture in so many ways; as owner/operators, land-owners, workers, mentors and so many more. As a woman who worked in the agriculture field for the past 11 years, I feel our world is long overdue to start bringing images of women in agriculture to the forefront. The MOSES Rural Women’s Project supports women farmers and food-based ecopreneurs, providing resources, networking and collaborative opportunities to champion new business start-ups that support food system change. The WFFA’s mission is to build strong women leaders, strong networks, and an even stronger agriculture and forestry sector by ensuring that women have access to the highest level financial and business management training along with an embedded leadership training program.